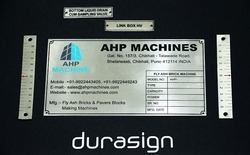 Prominent & Leading Manufacturer from Pune, we offer ss label, stainless steel labels and stainless steel label. 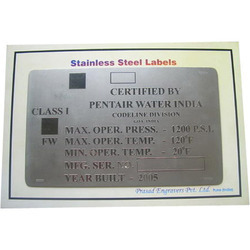 We produce the finest quality of Stainless Steel Labels and nameplates which are the toughest & durable material and has applications wherever severe conditions are to be sustained. This property of SS makes it a popular signage material and is very widely used in the industry. The process of making signage in SS involves chemical etching of the material and then providing required finishes such as mirror buffed, Matt, brush finish etc. The etched images are filled with durable automotive or epoxy paints for the everlasting effect. Again the durability and withstand level to harshest condition is the key of our product. We produce the finest quality of Stainless Steels Labels and nameplates which are the toughest & durable material and has applications wherever severe conditions are to be sustained. This property of SS makes it a popular Signage material and is very widely used in the industry. The process of making signage in SS involves Chemical etching of the material and then providing required finishes such as Mirror Buffed, Matt, Brush finish etc. The Etched images are filled with durable Automotive or Epoxy Paints for the everlasting effect. Again the durability and withstand level to harshest condition is the key of our product. 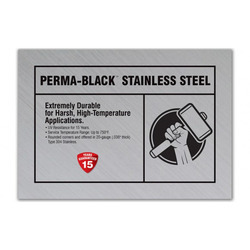 Looking for Stainless Steel Labels ?